If you did PC gaming in 2005 through 2010, you most probably have a hint on Logitech’s MX518 original gaming mouse. This was the greatest gaming mouse then, and after its replacement in 2011, the model became a product that gamers have been clamoring for all through. Logitech considered this, and now, they have made updates on the former version and released a legendary model, and named the gaming mouse Logitech G MX518 Legendary. G MX518 comes with Logitech’s innovative HERO 16K optical sensor, Omron switches with a 20-million click lifespan, and a new look atop the same design. But then, does this alone make the Logitech G MX518 Legendary mouse a worth purchase for 2019? Read on to discover what the re-release entails. People who have used the earlier version of Logitech G MX518 have a great idea on what to expect in the legendary model. Logitech just dusted off most of the same tools for the manufacturing process they used making the original mouse and as a result, the Legendary model has an exact shape as the older version and feels extremely close to it. MX518 Legendary gaming mouse feels like a mouse from a past era. This mouse eschews the straight lines and sharp angles found on mice such as Logitech’s own G502, and rather comes with rounded edges and graceful curves. The mouse’s right and left buttons seamlessly blend with the palm rest in one flossy shell, and the mouse wheel’s rubber finish is not grooved but is instead smooth. This makes the mouse feel old-school. MX518 Legendry’s DPI up and down buttons have been placed below and above the mouse wheel, and this is convenient than having a single button to cycle through presents anytime you need to make adjustments. Additionally, a profile cycle button is included to switch the 5 onboard profiles of this mouse. The new MX518’s sides have been well grooved to support your right-handed grip. The sides are made of matte plastic and have no rubberized finish. On the left side is a small lip for supporting your thumb. There are also two more programmable buttons (forward and back) on the left side to facilitate easier web browsing. Since all the mouse’s controls are on its crest, there are no toggles or controls on its bottom. All you will notice by flipping this mouse over are a Teflon ring around the optical sensor and three glide feet. These are meant to make the mouse travel smoothly across different surfaces. As a result, the Logitech’s Legendary mouse glides well both on soft and hard gaming mouse pads and is easy to use on finished wood desks as well. Many users find this mouse so natural in their hand, especially due to the support it gives to the thumb. 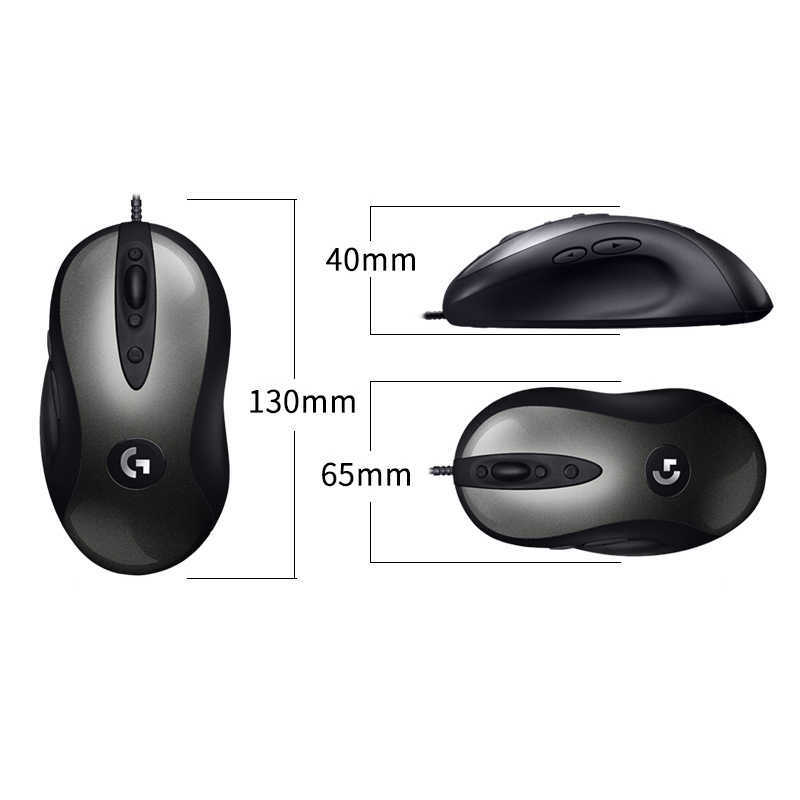 It measures three inches wide and five inches long, though it is about 10 to 15mm larger in length than most fingertip-style mice such as the Logitech G Pro. Hence, even though the MX518 legendary is only 101 grams, gamers who are used to a lighter touch may find too large. The legendary model is 5grams lighter than its predecessor and definitely feels downright airy to people who are used to heavier mice like the 147-grams MMO Corsair Scimitar mouse. The new HERO Sensor is the greatest addition to this mouse. The HERO 16k sensor is very useful in premiere gaming mice like the G502 and G PRO Wireless. This is a high fidelity sensor and is capable of sensitivities ranging from 100 to 16000. Although most gamers are unlikely to use such a high sensitivity, the sensitivity is capable of providing accurate tracking all the way through sensitivity range without having to apply any accuracy that kills acceleration or smoothing the mouse at higher DPIs. Also read: Logitech g203 prodigy review. Logitech MX518 Legendary is an impeccable gaming mouse worth the $59.99 it sells at, and one that lives up to its reputation. While the mouse lacks Logitech’s LIGHTSPEED wireless technology, you surely will be amused to find out the model feels close to the former version, has Logitech’s best optical sensor, and comes with improved switches.